A while back as a Monday Ideas Post I shared my idea for a quick feedback form, you can view the original post here and the republished post on the NZHerald (where it was hugely controversial). 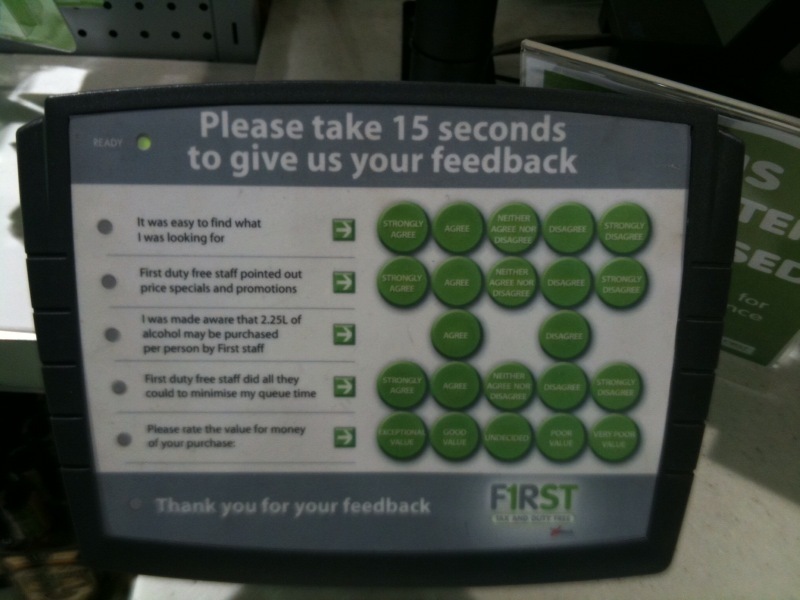 As a quick summary I suggested that stores add a device to collect quick feedback on your experience. You could even integrate into the eftpos machine to hasten the process. I was delighted to be greeted by this in a duty free store whilst away on holiday. How neat! A quick screen to let me provide some simple feedback. From the state of the machine I could tell it was well used. Airports are a double sided coin as customers are only likely to visit a few times, so it’s harder to collect feedback (but you have a location monopoly so average service can prevail). This entry was posted on Wednesday, September 9th, 2009 at 11:03 pm. Hi Ben, I think these surveys are a great idea and the other related idea would be to send an email out to clients after doing business (might not be practical in retail situation). Of course measuring whether your customers love you or not, in real time would be hugely valuable. FYI one NZ company I have worked with, that provides these systems is http://www.opinionmeter.co.nz. Thanks for sharing Duncan, another mentioned via twitter is http://www.touchpoll.co.nz – would like to see them in use a bit more though.